Emergence of masks coincides with heyday of animism: having populated forests, fields and rivers with spirits, people had to make arrangements with them somehow. But how to figure out what a non-evinced essence that lacks flesh wants? It was believed that in the course of a ritual messenger of the astral can settle in people and animals but how can one be sure that they’ll agree to leave in the good time upon ceremonial tamtams cease rolling? All kinds of backstabbing can be expected from fleshless guests therefore shamans would put on masks before their special rites suggesting that a spirit settle in them to secure themselves from magic influence. 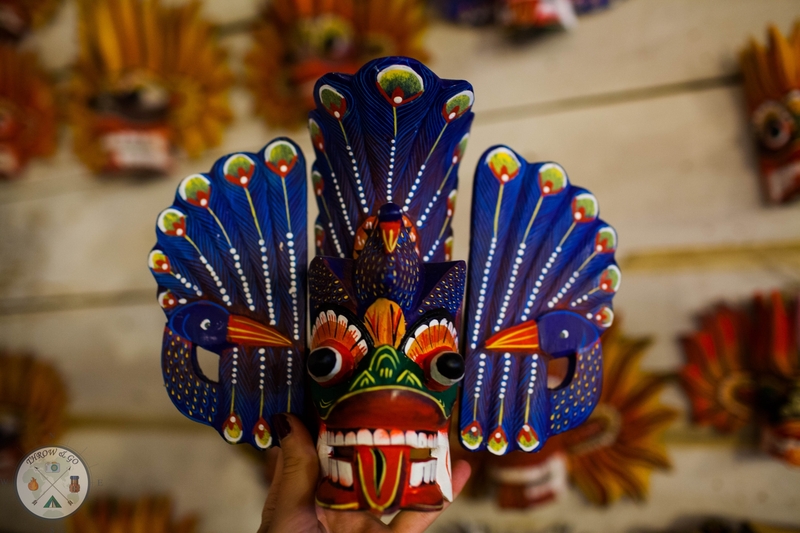 Art of carving masks emerged in near-shore regions of the south part of the island. Best workshops are concentrated in Ambalangoda town located in between popular resorts Kosgoda and Hikkaduwa. 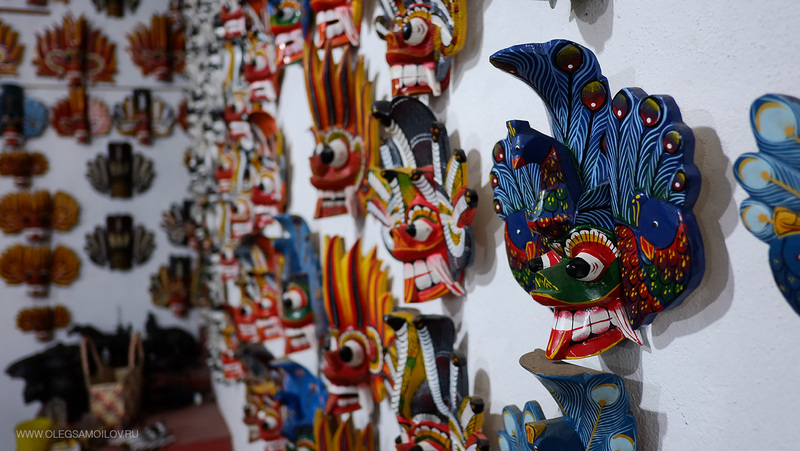 Masks Museum, founded by hereditary craftsman Ariyapala, operates in the city. On the first floor visitors get acquainted with basic principles of makeshift masks production however some details of the craft are still not disclosed and are only transferred from a teacher to an apprentice. On the second floor rich collection of ancient masks made by modern craftsmen is preserved, at that some of the items can be bought at a rather moderate price. Only Kaduru wood is suitable for production of masks, it is a source of the world’s lightest timber. Properly prepared wood material strikes with distinctive softness and inviolately obeys a chisel. Logs of wood are dried in the sun for some time until latex exudation stops, it is then sawn into wood bars of appropriate size and they are used to make intermediates for future masterpieces. After primary works, billets are treated with smoke for a week to make them resistant to rot and mildew, also, pungent smell scares away insect-pests. As soon as wood is smoke-dried, one can get to carving a face of a character. Craftsmen from Sri Lanka are virtuosos of drawing tiniest detail of facial expressions using minimal set of tools. Even at a third-rate countryside shop one cannot find two masks with the same expression – lively character and powerful charisma can be spotted in each item. Multiple-stage technology of painting of wood concludes creation of a magic image. For paint to spread in neat and even layers, timber is meticulously ground and polished, after that primer is applied to the surface of the mask. Delicate tints of saffron and turmeric are usually used as basic colors while selection of accent shades depends on type of the item: religious treatises stipulate unique color palette for each folklore character. Addition of Dorana oil enhances brightness of colors and protects paintings from burning sun rays. 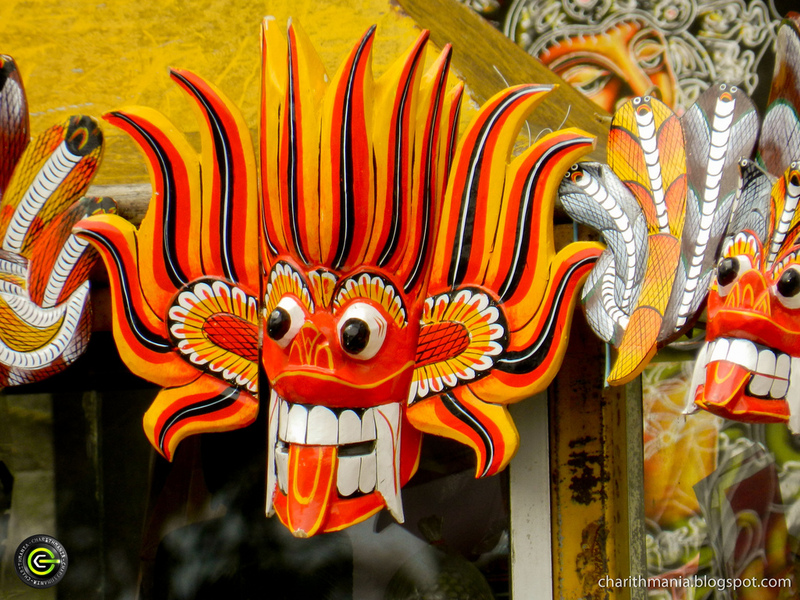 Depending on purpose, Sri Lankan masks are divided into three categories that follow different artistic canons. 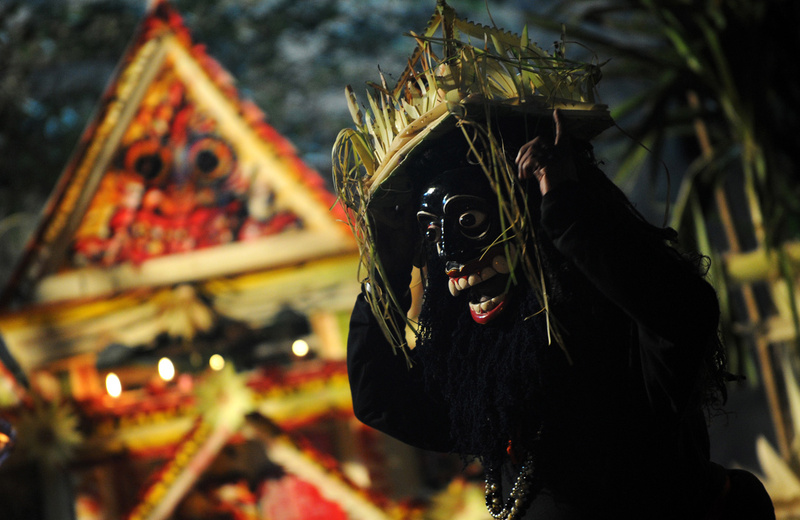 Sanni masks with sole-colored faces are meant to cure maladies send by demons. Treatment is sorcery of exorcism of a malady spirit. Upon feeling unwell, an islander would commit a sacrifice under supervision of a local shaman and call a demon featured by a man in a mask. Warlock would then ask an evil spirit why he is torturing the sick person and what kind of redeem he wants in exchange to agree to leave the poor sufferer alone. Normally good food, promptly served by other participants of the ceremony, suffices a demon. When full, a demon would perform a rite dance and depart with dignity. Realistic Kolam masks are used for theatre performances instead of makeup for actors. Legend has it, theatre masks emerged on Ceylon on a whim of King Maha Sammata’s wife who desired to watch a performance with guisers. Theatre didn’t exist back in the days and nobody knew how to fulfill a desire of the yearnful queen. Having heard desperate prayers of her crown-bearing spouse, supreme God Sakra sendt Vishwakarma, the patron of crafts, who taught courtiers acting techniques, thought up a story for staging and carved masks for actors. Manufacturing of Raksha requires raving imagination and faultless technique of handling a chisel. Chimeric goggle-eyed monsters with sharp fangs covered in shiny scales that feature Rakshasas – demonic creatures banished from Sri Lanka by prince Rama. Admittedly, islanders aren’t too afraid of demons and eagerly adopt their patronage by decorating walls and doors with Raksha masks. For instance, Rakshasa called Naga crowned with king cobras attracts luck and protects home from natural hazards, robbery and witchcraft. For success in business one should have an image of Ginijal Raksha in the room – fire demon with mane of flames. Mask of the spirit of death Maru Raksha, surrounded by dancing peacocks with wide-open tail, is believed to be the most powerful protective amulet against evil spirits. Hinduism does not approve of friendship with Rakshashas but Sri Lankans manage to please both Gods and demons preferring not to get involved in epic fights of good and evil but quietly enjoy humble gifts of destiny instead.